(8 Russell Terrace in their time). John was born in Caversham (then in Oxfordshire) in 1881, the son of Stephen Hayes and his wife Louisa Ann née Mitchell. The 1911 census asked couples to state the number of children they had had, how many were living and how many had died. In Stephen and Louisa's return they noted that two of their six children had died, but the form did not ask for the children to be identified. Five of the children have been identified; in addition to John they were Frank (born in 1877 as Frank Mitchell - before the couple married in 1879), Percy (1879), Mary Ann (1883) and Florence May (1890). The sixth child presumably was born and died between censuses - infant mortality was high. It would appear that Frank died in the 1880s (he does not appear with the family in 1891); there are several age matching Frank Hayes/Mitchell deaths in that period. It is also possible that he died later, or that he was not Stephen's son and was not included in the 1911 census return numbers and that a second infant mortality occurred. Both Stephen and Louisa were originally from Welford, but Stephen’s work as a railway guard took them around the country. However, at the end of his career they were close to home, living with Louisa’s sister, Sarah Cuthbert, in Westbrook, Boxford. John would have left school at the age of 12 or 13 and begun work, as an errand boy or a labourer on a farm – uninspiring work for a young lad. It seems that he may have spent some time in London because he was, for a short while, a soldier in the London Rifle Volunteers, a local militia unit amalgamated into the Territorial Force in 1908.
service in the Boer War. In 1899 he answered the call for volunteers to take part in the war effort against the Boer uprising against the imposition of British over Transvaal and the Orange Free Staterule. He enlisted on 11 September 1899 into the Royal Army Medical Corps. After a short training period he was appointed as an Orderly, 3rd Class on 29 December and little over a week later he was on board a ship bound for South Africa. 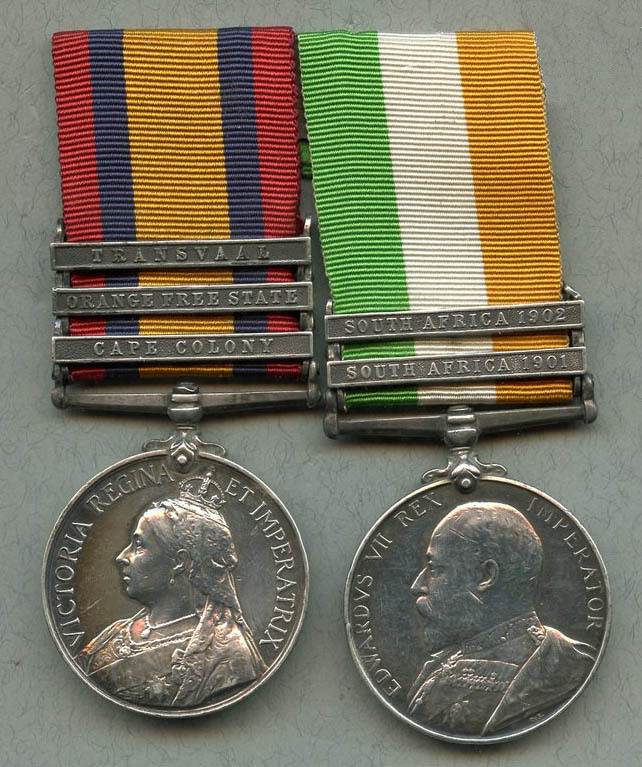 He spent over three years in South Africa, serving with the 15th Brigade Field Hospital and qualifying for the award of the Queen’s South Africa Medal (clasps for Cape Colony, Orange Free State and Transvaal) and the King’s South Africa Medal (clasps for 1901 and 1902). In June 1903 he arrived back in England and in March 1904 signed on to extend his service with the colours to eight years. On 10 September 1907 he left the army for civilian life, though continuing to serve part time as a member of the Reserve. Exactly four years later he was fully discharged on the termination of twelve years service. 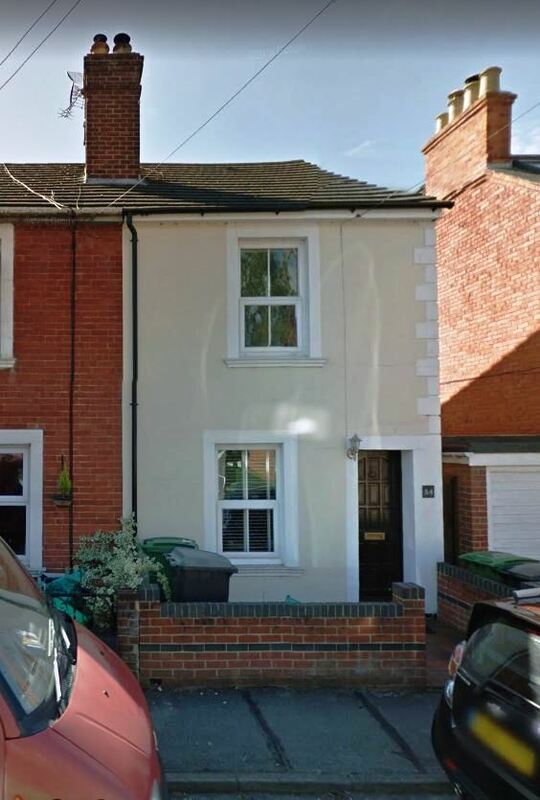 It is likely that his service (for which he was ‘granted’ a Good Service Badge) stood him in good stead when he sought employment with the Post Office; by 1911 he was delivering mail in the Wokingham area and lodging with a widow (Jane Leadbetter) at 13 Havelock Road. While he was in Wokingham romance bloomed and, in 1912, John married Kathleen Ellen Smith. In 1914 the couple moved to Newbury, where John was based at Newbury Post Office. They set up home in 8 Russell Terrace, Russell Road, now simply 84 Russell Road. After war broke out in 1914 John did not volunteer to fight; perhaps he had seen enough of the Army in South Africa and beyond; perhaps the responsibility of a wife and a child (their son, Percy Alfred, was born on 3 November 1914) was more important to him? In 1916 he could no longer avoid the army; he was conscripted and joined up on 24 July. 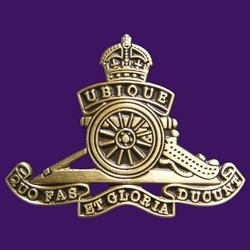 He was not sent to his old arm of the service, the Army Medical Corps instead he was posted to the Royal Artillery ending up as a Gunner in the 90th Heavy Battery of the Royal Garrison Artillery. By mid 1917 the 90th Heavy Battery has six 60 pounder (5”) guns with a total of around 300 men. It was a part of 80 Brigade (also known as 80th Heavy Artillery Group). In October 1917 it was supporting Second Army activities. The main roles for their large guns were counter-battery work (disabling/knocking out enemy guns) and destroying enemy defences (it took large shells to destroy a concrete pillbox or deep dugout). The long range of the heavy guns would also be used to disrupt the enemy well behind his lines making it difficult for troops and supplies to be brought forward. 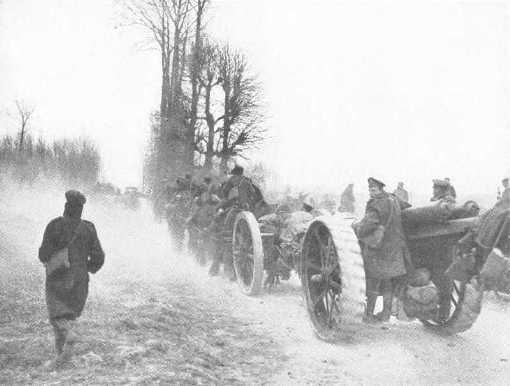 An RGA Heavy Battery on the move in France. The horse drawn gun is a 60 pounder. From the summer and into the autumn of 1917 the British launched a series of attacks on the German positions around Ypres (Ieper) in Belgium. Officially these attacks are collectively known as the 3rd Battle of Ypres, but are better known as the Battle of Passchendaele. Each is individually named, including, confusingly a ‘Battle of Passchendaele’. On 4 October the Battle of Broodseinde took place – unlike so many WW1 offensives it was a total success! It was the third of a three ‘bite and hold’ attacks spearheaded by the British Second Army against targets on the Gheluvelt Plateau. These attacks were limited in their scope concentrating on capturing enemy positions within range of British field artillery, consolidating the positions gained and defending them against the inevitable German counter-attacks (take a bite out of the enemy line and hold it). It was a brilliantly successful way to make small gains, but it then took two weeks or so to move artillery forward and otherwise prepare to take the next bite. Battle Targets from 5.30am:- Total rounds fired during the day up to midnight = 1038. Battery position and Damstrasse shelled all day with 15cm How and during the evening by 15cm Gun. Bombadier Edwards HE and Gunner Hayes J wounded, the latter seriously. Battery put 120 rounds shrapnel on roads behind enemy line at irregular intervals from dusk till dawn. It is unusual to find an individual of John’s rank named in a unit war diary in this manner. The strange ‘code’ at the beginning of the entry is a map reference identifying the battery position as a spot marked as Oostboek Estaminet on contemporary maps. Today it is a bend in a country road as it passes through the flat farmland typical of the area (Lat 50.806413, Long 2.904677). Dam[m]strasse was an old German trench crossing the fields a few yards away. Hayes – Died of wounds in France, on October 4, 1917, Gunner John Gardner Hayes, RGA, dearly beloved husband of Kathleen Ellen Hayes, of 8, Russell-terrace, Newbury, and youngest son of Stephen and Louisa A Hayes, of 39, Surrey-road, Reading (late of Boxford, Newbury), aged 37. Gunner John Gardner Hayes, whose death was reported last week, as having resulted from wounds on October 4th, at No 57 Field Ambulance, France, joined up on July 24, 1916, as a gunner in the Royal Garrison Artillery. While in this country he was stationed at Plymouth and Woolwich. He sailed for France on December 25th 1916, having previously been home on leave the previous November, but had not had a leave since being in France. His last letter was received October 6th 1917. No other account of his death has been given except that above. He served all through the South African War in the Royal Army Medical Corps, and had three stripes and two medals. Before joining up he was a postman at Newbury. He leaves a widow and one child. His only brother is now serving in France in the Royal Engineers. John was buried in grave I. K. 31 at Voormezeele Enclosures No.1 and No.2 Cemetery 4kms south-west of Ieper town centre. 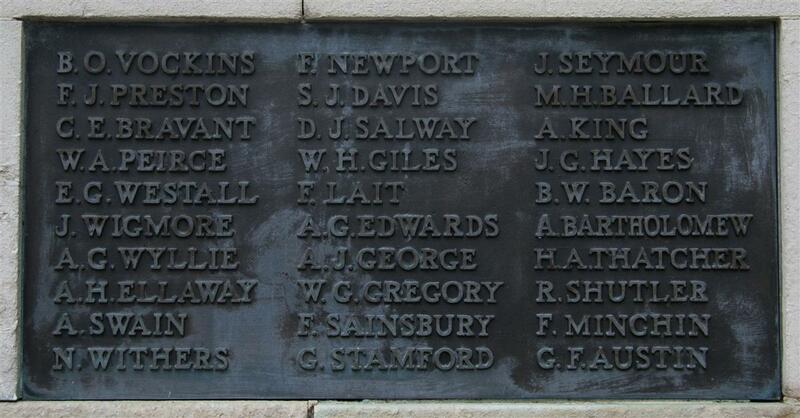 Locally he is remembered on Tablet 4 of the Newbury Town War Memorial, the parish memorial board and roll of honour in St Nicolas’ Church and on the brass plaque commemorating the fallen from Newbury Post Office.